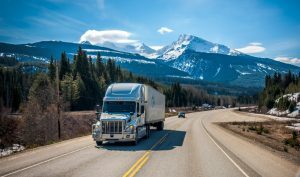 Truckload Rates: What Goes into a Freight Quote? Why do truckload rates change so regularly? To help shippers better understand why costs are different per mode, distance, and product, we’ll be doing a blog series that dives into specific cost variables. 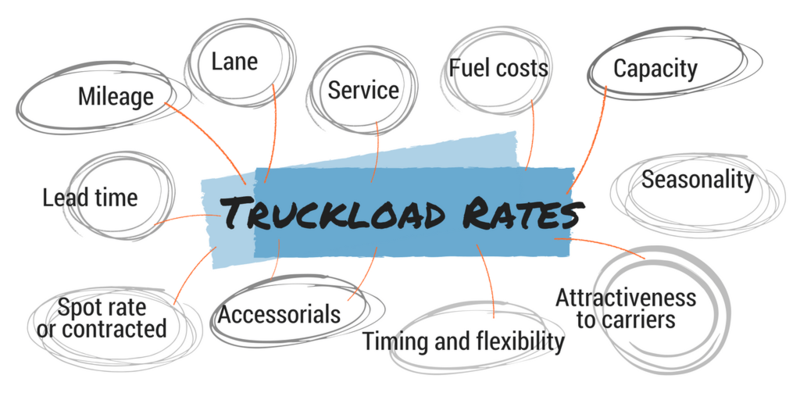 We’re starting with full truckload rates (FTL) because it is the most common mode. It is used when a single shipper produces enough cargo to fill up an entire truck. Truckload rates are arguably the simplest mode calculation, using a cost per mile traveled or a flat door-to-door rate. For the most part, the type and amount of product being shipped does not impact the truckload rate as long as the normal freight insurance is adequate and the total weight is under 45,000 lbs. Still, that flat rate is calculated using a multitude of variables. The key to being a smarter transportation professional is understanding the inputs that go into rate calculations, then using them to drive future decisions and strategy. Mileage plays a role in dictating total cost, but unfortunately, the calculation isn’t that straightforward. Longer distances will still incur higher charges because of the increased amount of fuel and driver time required. But not all lanes cost the same, even if they are the exact same mileage (keep reading to understand why). A lane is described as an origin to a destination and can fluctuate in cost based on freight volumes in and out of those two areas. Cities that have a high ratio of trucks to available freight may be cheaper to ship from than other locations with higher volumes than drivers. For example, Chicago is typically less expensive to ship to and from than a small town in New Mexico. Overall truck availability vs. the demand for services will always have an impact on freight rates. Capacity tends to switch seasonally (see details below) but can also change due to outside forces such as equipment sales, employment, cost of living, natural disasters, etc. You may have heard your logistics partner(s) mention holiday surcharges or produce season as reasons behind increased or decreased costs. This is another classic example of supply vs. demand. During certain times of the year, typically April to July, it costs more to move product out of heavy produce production regions such as Florida and Georgia because trucks are less plentiful, already booked up with moving seasonal fruits and vegetables. When crops are ready to ship, demand for transportation – particularly refrigerated – rises, available capacity shrinks, and rates increase. Similarly, for retailers, there is typically a rise in rates during Q3 and Q4 of the calendar year as they prep for big events like holiday and back-to-school rushes. They order, import, and ship larger volumes. To adjust for added demand, many carriers will implement peak season surcharges and capacity can decrease. What days and time windows are available to drivers for pick up and delivery? Weekend orders or those scheduled for odd hours in the early morning or late evening aren’t accommodating to carriers. Orders can certainly be booked in these instances, but drivers may charge more. Additionally, do your time windows have any flexibility? A two-day window may enable a carrier to better route your shipment along with other orders they are responsible for. Helping them to maximize their capacity could lead to lower rates. Restrictive schedules may lead to higher rates because they need to make up for lost revenue. Do you have a standing relationship with a carrier to move this shipment on a reoccurring and regular basis? This arrangement provides carriers with consistency and the ability to plan, which in turn can help facilitate a lower cost. Day-of or one-off orders posted to the spot market tend to cost more. Like spot vs contracted rates, the more time you provide a logistics partner to book and plan for an order, the lower your potential cost. Here’s an example of lead time’s impact on price. Another main cost component is fuel surcharges, which move based on the market price of diesel. While this was not the case 10+ years ago, it is common for carriers and other logistics service providers to raise and lower fuel surcharges weekly as the price of fuel changes. Accessorials are costs that can be incurred during a shipment for additional work required, such as detention or special handling – lift gate, driver unload, etc. These are generally billed ad hoc, and are not part of the base rate of a shipment. But, if communicated up front, these additional charges can be planned for or avoided. There is a classic debate in trucking that warrants mention on this list; service or price. Does your order require extra attention, communication, attention to breakage, specific expertise, or have strict deadlines? Moving items that demand high service levels or more reliability tend to cost slightly more than those that don’t. Example; recycled plastic vs. cold-pressed juice in glass bottles. Provide your transportation partners with as much information as possible and as early as possible. As you can see, a lot goes into determining a freight rate. If you provide details upfront, less back-and-forth communication will be required, orders can be handled quicker, and quotes will be more accurate and often cheaper. Calculating a single freight rate is hard – considerably more so when doing it with multiple carriers and mode options. 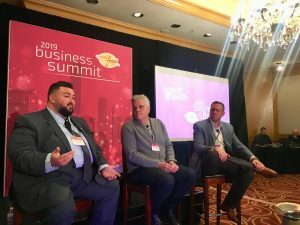 Leveraging logistics partners and technology are the best ways to make sure shipments are being optimized for cost and service. Stay tuned for Parts 2 and 3 of this series. We will share what goes into quoting other modes of transportation; LTL, Intermodal.